October | 2015 | WE BIKE, etc. We were not able to catch a ride north so we jumped back on the bicycle and headed north. Thank goodness today the wind was at our back and we made the 84 miles after 5 hours on the bicycle compared to 6.5 hours on our trip south. We got back to New Orleans about 3:00pm and checked in to our hotel for a nice evening of rest and relaxation. We plan to explore New Orleans for the next couple of days and just enjoy ourselves. Thanks for following our trip and keeping in touch – it means a lot to us and helps with the loneliness you experience on the road. Well we are done!!! YEA!! Today ended up being a bit longer than we thought and tougher due to the strong headwind. The ride down to Venice was actually uneventful and there was not a lot to see with the levee on one side and trees on the other side we could not even see the water. Our trip began with a ferry ride from New Orleans to get us on the west side of the river so we could go all the way down to Venice – a ferry located further south was out of service so we had to get on the west side early. A woman who commutes to work on the ferry helped us to get on the ferry, off the ferry and to the trail we needed to head south – it is always nice to have help from someone that lives in the area and knows actually what to do. After a long day in the saddle we finally made it to the end and took the mandatory picture of the south most point sign – see attached. The sign was actually located in a industrial area and no one was around to take a picture of the two of us so we had to take one of each of us at the end. So there you go another trip completed and now all we have to do is bicycle back to New Orleans – we are actually pretty burned out and are looking for a ride back north. I have a feeling we will not find one and end up pedaling our way north – hopefully the wind will be at our backs! 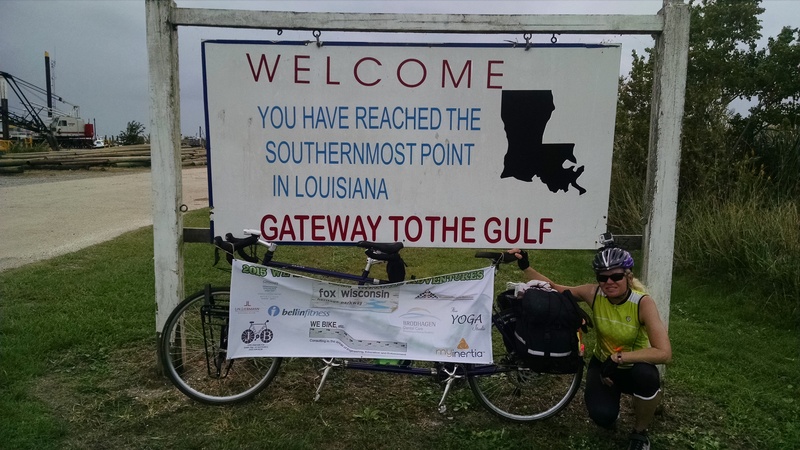 Made it to New Orleans, LA – Down to Gulf yet then , Done!! Today we traveled to one of our final stopping points – New Orleans, after a day off we will make the final push to Venice, LA – the Gulf of Mexico. Our ride today was fairly easy and was primarily along or on the levee road. The hard part was the directions were very screwed up and hard to follow, he kept pulling us off the levee road for no apparent reason and directing us to the adjacent road, also the levee road was under construction in two places and we had to get off and find our way. Of course no directions were given on how and when to get back on. 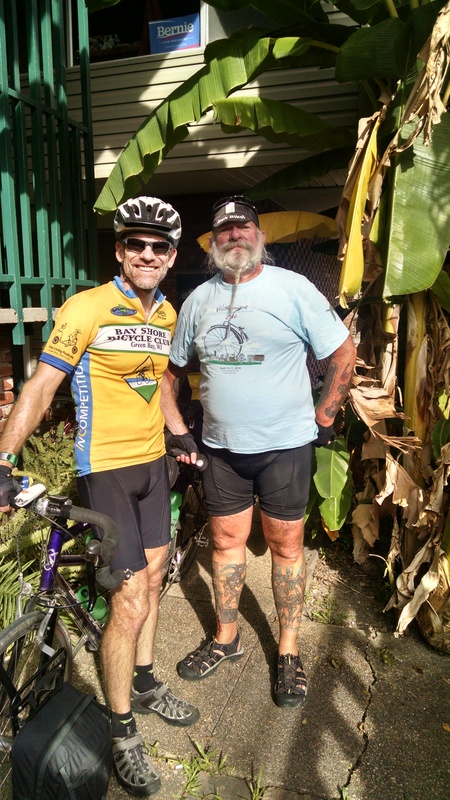 We finally got to New Orleans/Audubon Park and met up with Peter Hickman, a high school friend of Peter’s. We will be staying with him for a few days. He met us at the park on his bike and then we rode back to his place in Mid City. Peter had to stop at some of the local colleges to drop off some information so we just tagged along. We were on the Tulane and Loyola campuses. Very nice urban schools. While waiting for Peter Hickman, at one school we were relaxing next to the fully loaded tandem and a college student came up to talk with us and had bicycled across the country last summer and was explaining how much he enjoyed it and the great adventures he had. After talking for awhile he suddenly said “oh crap I have to go I am going to be late for class” and off he went. He even offered us a place to stay if we needed one for the night – he said he lived off campus in a house and had lots of room. He was familiar with Warm Showers and had used it on his trip. We then headed to our home for the next two nights – Peter’s house in Mid City- it was great to just follow Peter and not have to worry about directions!! We got in showered and went out to dinner. Tomorrow is a day off and then we head to Venice, LA and the Gulf of Mexico to officially end our trip!!. We left the hotel by 7:30am and headed down the road to find the Uptown Grocery to get supplies for camping that night. 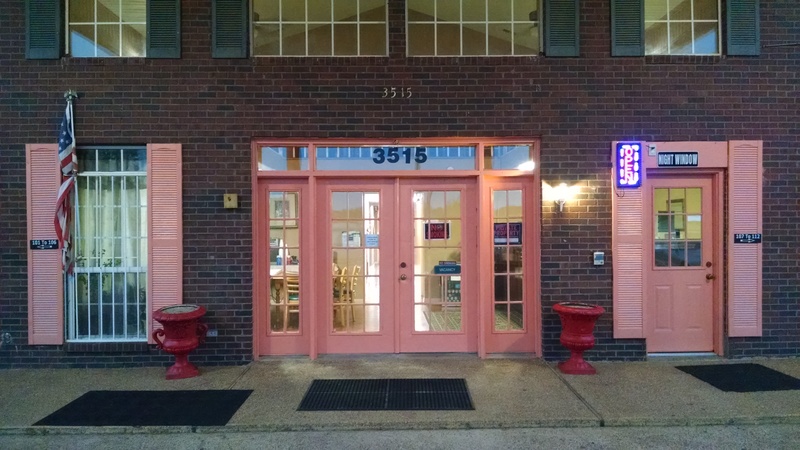 Unfortunately the grocery store was not open yet so we decided to head to Vadalia, LA – just across the river from Natchez to hit their grocery store. 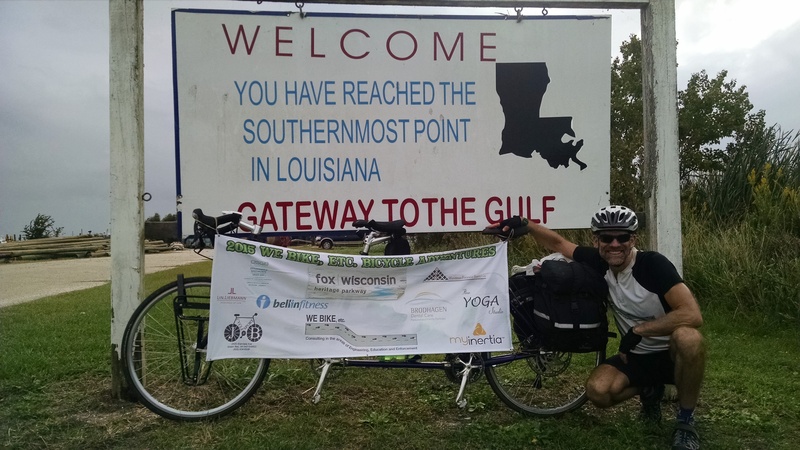 We crossed the Mississippi on Hwy 65/80 into Louisiana – yea we have finally made it to our finishing state. We found the grocery store but had to go off route about 5 miles total – not too bad. In Natchez and Vadalia the big balloon festival was going on so we were glad to get out of town before everyone got to town!! Supposedly there were some balloons up early this morning before we left but they just looked like dots to us. We were glad to get to town the day before because we would not have had anywhere to stay on Friday night. Our ride was mainly on Hwy 15 which traveled on the levee or right next to the Levee – it was an easy ride not too much traffic and the road was generally in good shape. We took a break to eat our lunch on top the levee – there really is nowhere to go to get off the levee and we experienced an Act of Kindness. So we were standing along the side of the road eating lunch when a Louisiana State Wildlife Officers truck stopped – the officers stopped to see if we were ok and if we needed anything. We said we were good and just taking a break to eat lunch. They again asked if we needed anything and said they had water if we needed some. That we took them up on and filled our water bottles with some nice cool water – it was greatly appreciated and allowed us to bypass the Army Corp of Engineer where we were going to fill up our bottles. The officers were really nice and we enjoyed talking with them – they were amazed that we had bicycled all the way from Green Bay, they probably thought we were nuts!! Oh well. After visiting with the officers they headed down the road and we headed the other way. Soon we left the Levee Road and were once again on Hwy 1, the road is normally in good shape and has a nice wide shoulder – this one was at least 12 feet wide. We even skipped a part of the route which took us thru the town of Batchelor to stay on Hwy 1 with the great shoulder – we don’t think we missed too much in Batchelor but a five mile detour. Sometimes it is hard to understand why the route takes us on these weird detours and we have started to bypass some of them. The detours we believe are to get the bicyclists thru another town and also possibly closer to the river – but not quite sure!! Our day ended at the Maxicare RV Park and Campground in Morganza, LA. The campground is very nice and has everything we need and then some. 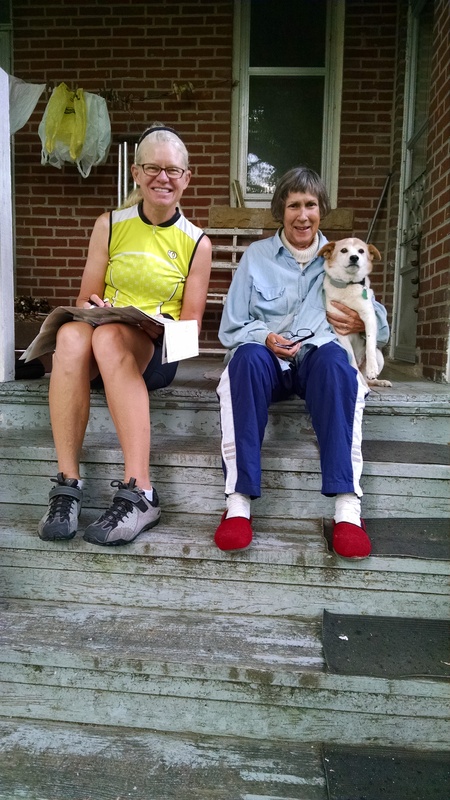 The camp host – Beverly is very nice and used to hosting bicyclists – she said frequently she has big groups stay with her. The Southern Tier Bicycle Route goes righty by her campground, as well as the Mississippi River Trail route. She appears to take good care of the bicyclists and is very welcoming to them. 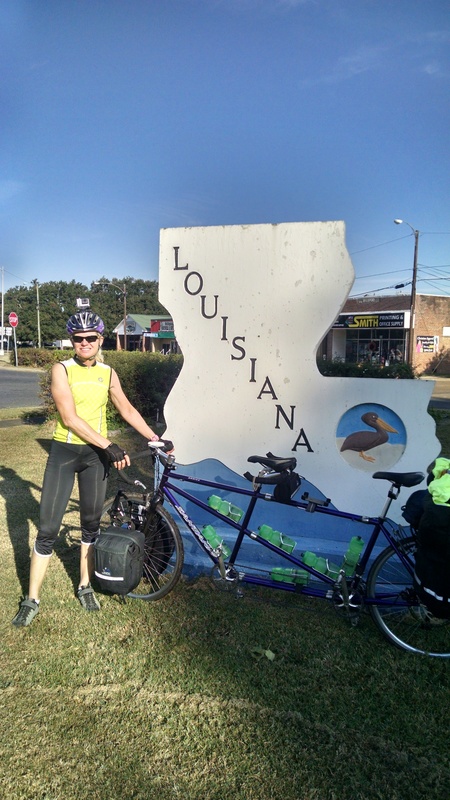 We have two more days of bicycling and we will be in New Orleans, we then plan to take a day off and then head down to the Gulf and officially end the trip. We slept in a bit later than usual because we had a shorter day today – only 50 miles to Baton Rouge. It was fun to camp again it has been a while, the last time we camped in Mississippi the campground was pretty sketchy and we did not feel comfortable there – this one was very nice and welcoming – nice. Also realized this will probably be the last time we will camp on our bicycle trip. Our trip began with another our last crossing of the Mississippi River on the SH 10/Audubon Bridge which is a fairly new bridge – built in 2007. The bridge was nice and included a nice big shoulder for bicyclists. Ironically when it first opened the shoulder had rumble spots all the way across the shoulder, this made it close to impossible for bicyclists to use the shoulder. Also no one told the police that bicyclists could legally use the bridge- so they were stopping the bicyclists on the bridge. After a few calls to the Baton Rouge bicycle advocacy group – their president contacted the DOT and explained the concerns and the rumble spots were removed across the shoulder and the police were informed that it was legal for bicyclists to ride the bridge. We learned this from our Warm Showers host Mark who is the President of the local bicycle club. We were cruising right along and figured we would get to Baton Rouge to meet our host who was going to ride with us the last ten miles by 12:30pm. 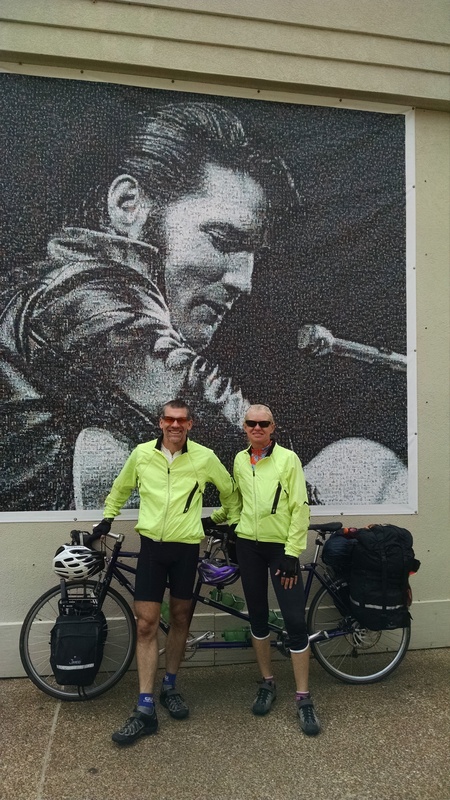 We were about 10 miles from meeting Mark and the bicycle started making some nasty noise – of course it was as we were traveling along a busy highway. We stopped and looked down and the bicycle rack had broken – crap!! Now what – Tracy took the bags off the rack and Peter started to walk down the road to try to find something to fix it. He came back with a ten penny nail and a short piece of rebar – with the duct tape we carry he was able to fix the rack – very innovative!! So with a 15 minute delay we were back on the road and were only a half hour late to meet up with Mark. We then followed Mark into the city- unfortunately we ran into all the traffic for the LSU vs Florida college football – it was unbelievable traffic and we stood on our bicycles for a good hour and moved very little – it was fun to watch the people and a good chance to get to know Mark. After an hour and a bit of movement we were able to get on a sidewalk and actually travel some miles towards Mark’s house. The traffic was unbelievable and it was difficult to get anywhere but we finally made it to Mark’s about an hour later. Just FYI. LSU did win the game 35 – 28 – a good game – we watched part of it at the restaurant we had dinner at. We also got a tour of downtown Baton Rouge, they have been working hard to revitalize the downtown – they have some really cool areas but pretty limited and quickly you walk away from the active downtown area. It was fun to get the grand tour and background from a local and hear the scoop on everything. 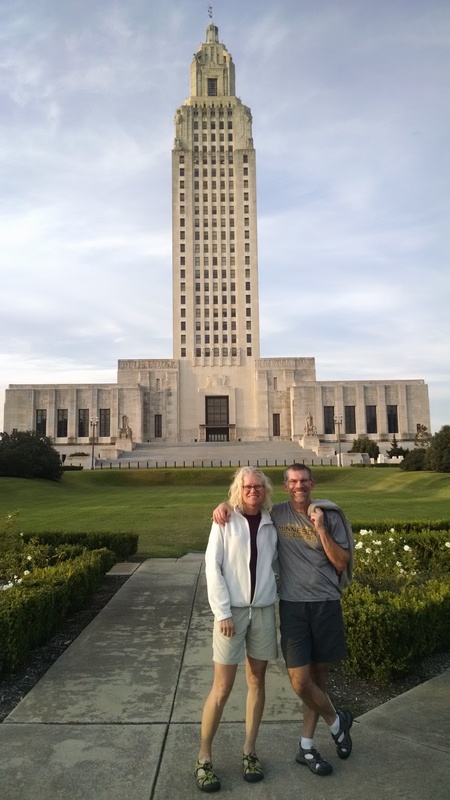 Mark, our Warm Showers host works at LSU in the library in the archives, he has worked at LSU for a long time but is ready to retire soon and would like to take off on his bicycle on a long trip!! 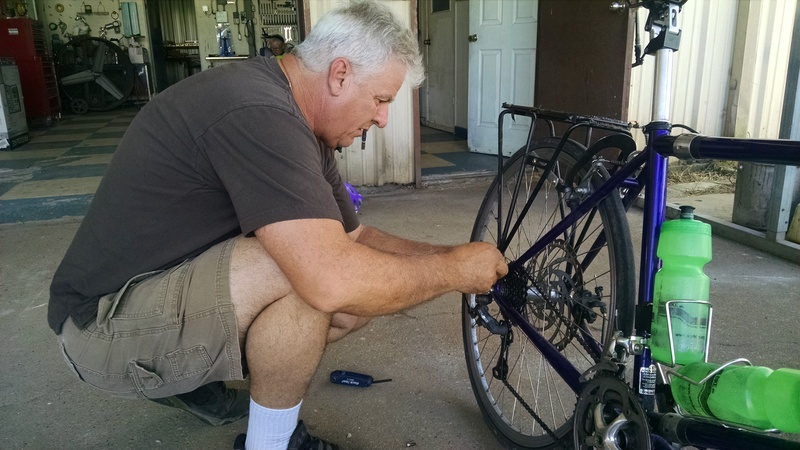 Mark started the Baton Rouge bicycle advocacy group and has had his hands full trying to make a difference in the city. He feels like much has not changed but as he talks about it there really has been quite a few improvements. After a delicious breakfast with Mark – oatmeal. Mark rode out of town with us. We rode thru LSU and saw the mess left behind from the game the night before, although staff was very busy cleaning up already when we went thru. Mark assured us there will not be a piece of garbage remaining by the end of the day. We also went by the Cow Pasture(RV Parking Lot) and saw all the RV still sitting there. Later we had many of them pass us as they headed home. We spent most of our ride today on Hwy 75/River Road. We had the levee on one side and sugar cane fields and refineries on the other most of the day. Although as we got further south we started to see the beautiful plantations. Our ride ended in the City of Luther with a stay with a Warm Showers host – Dale. Dale is a mechanic and was able to make a more permanent fix on our bike rack and seemed to enjoy doing it; so we should be set for the rest of the ride and then some. 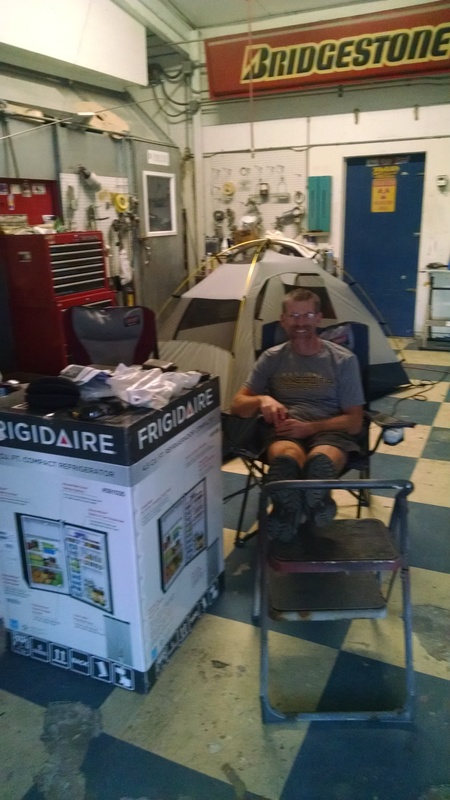 are staying in his man cave, basically his shop – it has everything we need including a stocked refrigerators, microwave, restroom and sleeping space. Peter is happy because we got here in time to watch the Packer game and he is happily watching on his phone. Tomorrow we will hit New Orleans. 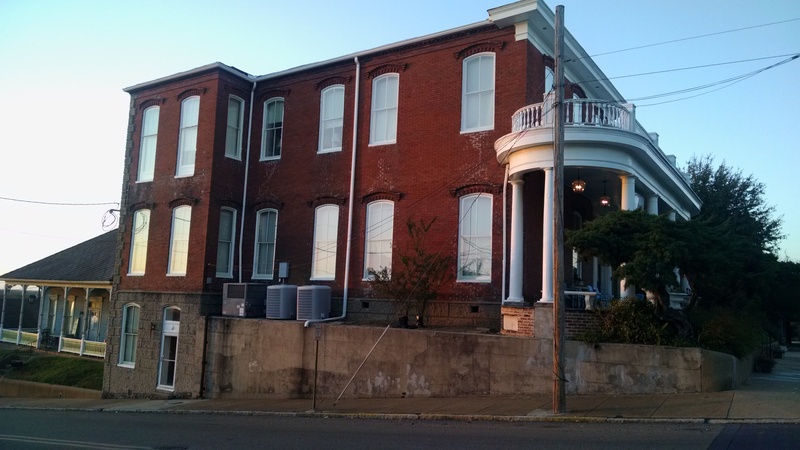 Spent the day exploring Vicksburg – really cool city would like to come back to check out some of the attractions we were not able to see on this trip. Spent most of our time in the historic downtown area exploring. The day started with a great breakfast at the B & B – Andrew is quite the cook and made us a delicious southern breakfast. We also got to know the other couple staying at the B & B Tommy and Vicki from South Carolina very nice older couple who we enjoyed getting to know over breakfast. The day of course goes too fast and soon we need to get ready to take off the next day. Started the day early to try to get in before the heat got too bad. Andrew was gracious enough to get up early and make us a special breakfast before we left. He made us amazing fruit smoothies, fresh baked blueberry muffins and hard boiled eggs. It was a great breakfast to get us started with lots of energy. Our stay at the Bazsinsky B & B was great and the house is very nice and not too over done like some B&B’s Andrew and his partner David are great hosts and are more than willing to help in anyway. It could not have been a better stay. So we were on the road by sun up 7:30am. 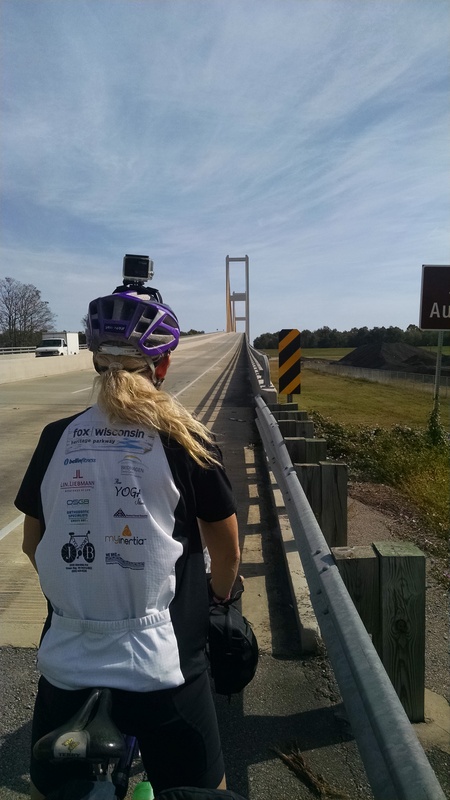 Getting out of Vicksburg was pretty easy and before we knew it we were on the Natchez Trace Parkway peddling away to cover the 49 miles our route took us on the Trace. The Trace Parkway is a bicyclists dream – the road is in great shape, pretty much level, very low traffic, 50 miles per hour speed limit on the Trace and no commercial vehicles allowed to travel on it – so no trucks. The road is also shaded which was very helpful today with the hot sunny 94 degree day. The Trace Parkway for those of you who are not familiar with it. The entire parkway is 444 miles long and goes from Natchez, MS to Nashville TN. Originally the route was used by Native Americans and was well enough established it was included in the earliest maps draw by the French in 1733. The Old Trace is best know as the return route by farmers from the Ohio River region who would float down the river with their crops to Natchez and New Orleans – then sell the lumber from the boat and then travel back the most direct route the Trace. It was the most heavily traveled route in the Southwest during the 1800’s. At it’s peak before steamboats became the favorite means of travel there were more than 20 inns along the Trace. Today only one remains. Once we got off the Trace we only had about 15 miles to go to get to Natchez – it was a nice ride thru some amazing forested areas. Natchez is a nice city and we have been able to explore it a bit this evening. Tomorrow they have their big balloon festival going on and every hotel room is booked in the city and the place will be packed – luckily we will be heading south to get away from the crowds – although it would have been cool to check out the balloon fest. Got up early and left Cleveland by 7:30am because we knew we would have a long, hard day ahead of us. First we had to travel approximately 20 miles to get back on route and then we could start heading south again. Our route today was primarily on SH 1 which travels thru the agricultural areas of Mississippi. All we saw all day was cotton, bean and some corn fields. It is amazing to look around as far as you can see and see nothing but fields of crops. It is also nice to have very few cars on the road there really is not much of a reason fore anyone to be out on the roads except for the farmers. There are no homes and the small towns are few and far between. We traveled 30 miles on SH 1 at one point and had no cars pass us – it was very nice. It is said that Mississippi is one of the poorest states in the US and I can believe that – the poverty we see in the small towns and the homes (shacks) that people are living in is very sad. When we stop at the one gas/convenience store in town it appears to also be the town gathering place and people are there watching the world go by – they are always very kind and welcoming but you can see how limited their world is. Our lunch stop today was at Winterview Mounds State Park and Museum where we got to watch the video about the mounds, get a personal museum tour from the park education director (a young woman from the Milwaukee area – in her first job) and a walk to see the mounds. The mounds were built in 1000 A.D. and there are twelve mounds at the site. The largest is the 55 foot high Temple Mound. You used to be able to walk up to the top of the mound for a great view of the delta farm land but the walk way has been closed for two reasons one is a young boy got hurt when he fell down the walkway and the other was the request by a local Native American tribe to not have everyone walking on this historic site that is so important to their culture. Sounds like good reasons to me. The last 25 miles of our ride stayed on SH 1 but by this time the head wind was stronger and the day was hotter – it was a hard end to our ride and we stopped ever 30 minutes to take a short break. We finally made it to Roy’s Store Cabins and Campground and it was like stepping back in time. The store had memorabilia everywhere and served as a grocery store, diner and gas station. I bet the store served the residents in a thirty mile radius – there just was nothing else in the area. It was a busy place and locals as well as fisherman from all everywhere kept the place busy. Evidently Lake Washington which is where Roy’s Store is located has the best Crappie fishing in the United States. It is very strange at the campgrounds that we have been able to find in the south they all seem to have lots of construction workers living at the camp in trailers. There are many construction projects going on in the area and places to stay are hard to find so many of the companies put their employees up at the campgrounds. It ends up being a very strange group of people at the campground. There for work not play!! For the first time while camping we did not feel real comfortable and safe – the campground owner made a comment about being aware and we have had several people warn us lately that Mississippi is not the safest place to be and camping in a tent is probably not the greatest idea. We have not had any problems, but we are not so sure we will camp again on this trip maybe if the campground is nice but otherwise we will try to find somewhere else to stay. Would definitely would not stay at a place like Roy’s again. It was another hot day on the bicycle and we wanted to make it to Vicksburg today, so we got up at 6:00am and were on the road by 7:30am. The first part of the ride was along Lake Washington – it was a beautiful ride with amazing views of the lake and our first views of multiple Cypress trees. It is so strange to see trees growing and thriving in the middle of a lake. They are interesting trees and look very different than our Midwest trees. I will try to attach the video of a portion of our ride, that shows the trees and the beautiful homes along the lake. Again we traveled on SH 1 and then on to SH 465 which traveled on top of the levee. Unfortunately we did not know they were doing construction on the levee – making it taller and the road was gravel and unpassable in one section. So began our ride on SH 465 and discovered the first 4 miles were in gravel – we could ride the bike on it but it was a challenge. They we got to the middle section and it was paved again – by this time we had been traveling on 465 for about 20 miles. We then saw a sign that said the road was closed four miles ahead- oh crap. We were so far into it that we decided to just continue on and deal with it when we got there. We got to Chotard Landing a campground/resort just off the levee road and right before the road closed. We bicycled down to the resort and took a break and talked with the manager for awhile – he was a great guy and very interesting. He also gave us a gallon of water to fill our water bottles. He told us about other bicyclists that had stayed at his place and was bummed we were not staying but we told him that we needed to continue on. Now the problem was how did we get thru the construction site and how long is it. 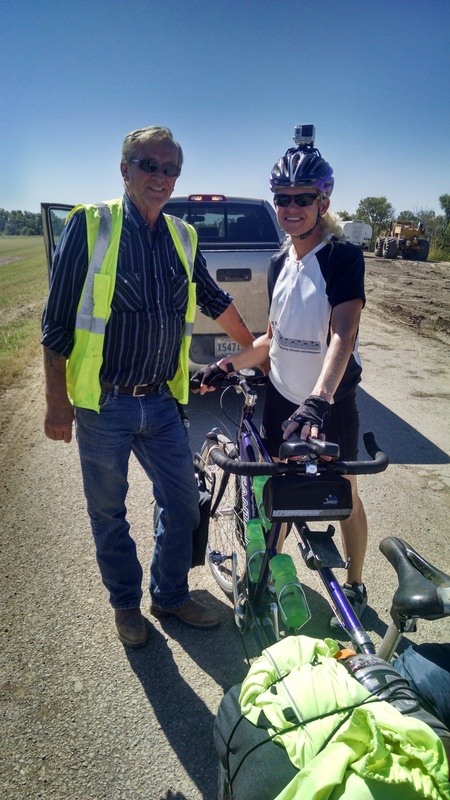 He suggested we check at the construction trailer and ask them for help and getting us thru – he told us they had helped out other bicyclists and hopefully would help us out also. So on to the construction trailer where the project manager contacted the Quality Control Manager and asked if he could get us thru. He said he would and told us to wait at the trailer. He arrived in his construction pickup and said we could put our bicycle in the back and he would give us and the bike a ride thru the construction area. It was great we would not have been able to get thru on our own and it was at least three miles long. He was a great guy and was onsite to make sure the project work made the required quality level – he is from Florida but his company won the bid for the project. He will be there until next January when the project is complete. He drove us to the other side where the pavement began again – YEAH!! At this point we had about 15 miles to go to our end point in Vicksburg, MS and planned to try to find a place to stay in the city so we could check out the historic homes and area. We got into town later than we planned because of our “road closed” problem and everything was shut down in town for the day – so we made an executive decision to spend an extra day in the city. Now where to stay – we have found that the local Chambers are great and the employees are very helpful – so Tracy called the Chamber and got some suggestions on where to stay and where to eat. We ended up at a beautiful bed and breakfast right downtown. 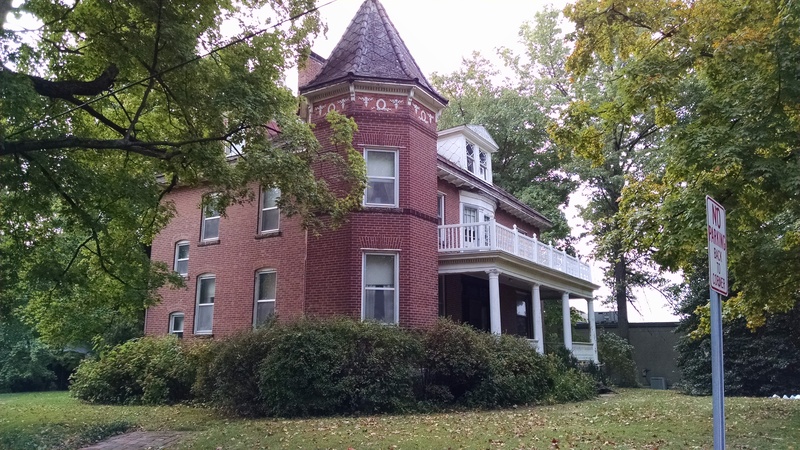 The Bazsinsky House was built in the 1860’s and survived the Civil War because it was across the street from the Court House where the south was holding the northern prisoners of war therefor the union did not shell the area and the house survived. It is beautifully restored and has two rooms for rent. We are in a large room that has a great view of the Yazoo and Mississippi Rivers. Looking forward to spending two days in the city and beautiful home. The owners are great guys and very kicked back they even have our tandem stored in the middle of their downstairs dining room!! Day off tomorrow and then we head to Natchez. More to come. Tunica has many casinos along the Mississippi River and up in the Tunica Resorts area. When we came into the area from the north the first casino we saw was the closed Harrah’s Casino and all the surrounding hotels, convention center etc. It was very weird riding into the area and seeing these huge building, parking lots, bus shelters etc. – all abandoned. Very eerie, we are not sure when the casino closed but it looked like it had been a while. Unbelievable the amount of money someone lost in that deal and such an eye sore for the community. Evidently the other casinos are doing well and the area is thriving – mainly along the Mississippi River. We got up early at our small motel in the City of Tunica about 9 miles south of casino row, to hit the road as soon as the sun was up – it was pretty foggy when we got up but by 7:30am the sun was up and the fog burned off – yes!! Today we went off route because there was no where for us to stay on route that was within a reachable bicycle ride. 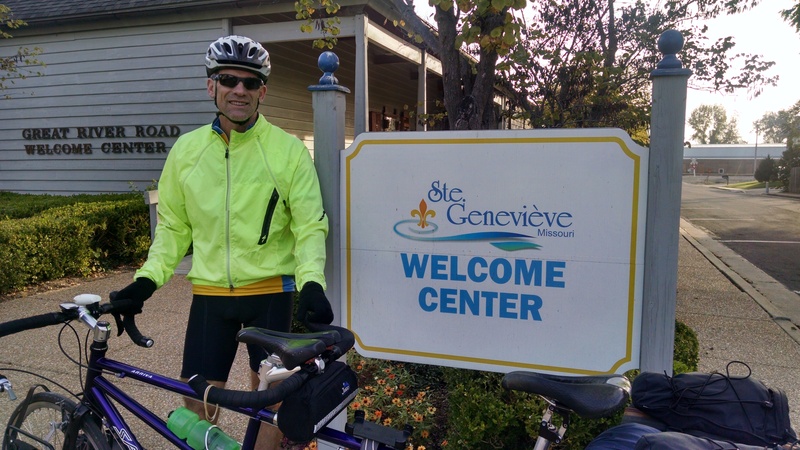 We headed back to Tunica and bicycled thru the historic downtown area – very nice and beautiful buildings. We then traveled along Moon Lake which was really cool with all the Cypress trees standing in the water. There were some beautiful homes lakeside as well. After the lake we headed east away from the Lake and the Mississippi River. Our off route took us thru some beautiful country and unfortunately some gravel road sections. One section we had to push the bike it was just too deep to actually keep the bike upright – luckily we only had to push for about a mile. The second section of gravel was after lunch and fortunately we were able to ride the bike the three miles. After the second section of gravel we finally got back on a paved road and are looking down the road and see a group of young men and 5 or 6 really hot cars sitting in the road- as we approached we realized we had come upon a drag race. The guys were nice and I think surprised to see us coming down the road but patiently waited for us to go by before they began their race. After their race they came flying down the road past us at a high rate of speed – Tracy was glad we had pulled over to check the map when they came by – much safer than having them come by us at those speeds as we were bicycling along. We go into the town of Mounds Bayou and stopped at the local gas station/convenience store for a snack – we ran into some of the guys in the hot cars and lots of locals. They were very interested in our trip and had lots of questions – it was hard to get going again for the last 10 miles. But we finally did and had an uneventful ride to Cleveland. There was lots of cotton fields to see today and cotton laying along the side of the road and piles of cotton along the road that looked like snow piles. Took the day off and explored Memphis – we had fun walking around town and checking it out. We went to the Cotton Museum – very cool, Ghost River Brewery, Post office – to mail stuff home, river park to eat lunch and watch the world go by, nap, walk to the High Cotton Brewery, dinner and wander thru Main Street and check out the shops and restaurants. Fun day and much needed day off the bicycle – Memphis is a nice city and is currently doing amazing amounts of work in the city to make it more user friendly. The people in Memphis are very nice and friendly- they really go out of their way to say hello and welcome you to the city. We left Memphis a bit later than usual because we wanted to stop at the bicycle shop to put some air in our tires. The shop was suppose to open at 10:00am so we got there early and had a coffee at the shop next door with plans to wonder over at 10:00am so we could get air and head off for our day of bicycling. Unfortunately the employee did not show up for work until almost 10:30am – we were just getting ready to leave when he finally pulled up!! We got the air and headed out to Graceland to check it out and decide if we wanted to see anything and if so how long it would take. By the time we got there a two hour wait was required to see the mansion, we decided a two hour wait was not going to fit into our day – snapped a few pictures and headed towards Mississippi. It was unbelievable how many people were there. It would have been fun to take a tour or two; I guess we will have to come back someday. Tracy’s mom is a huge Elvis fan and was at Graceland several years ago and really enjoyed the tour and suggested we check it out – good idea. We have found since entering the southern states campgrounds are few and far between and Warm Shower Hosts are also hard to find – so we have had to stay at hotels – unfortunately some of the hotels are lower level, but the only one available – for example tonight we are at the Royal Scott Inn and Suites in Tunica – not a great motel- the room does not smell so good!! Tracy was rather grossed out but there is nowhere else to stay so we are making the best of it and have the door and window open to air it out!! Hopefully that will help. Tomorrow we have to actually go off route about 15 miles to find somewhere to stay – we are not sure what will happen the next day – again no camping and hotels are hard to come by. Oh well we will make due with what we find. We are actually getting close to the end of our trip we have a little under 500 miles to go. It has gone faster than we thought and we are getting excited to get to New Orleans and the Gulf. Today was a long day, not as much mileage but the ride itself. The first 40 miles were on Hwy 61 and we were dealing with a cross wind the whole way – not real bad but it definitely added to the challenge of the day. It also was hot – close to 90 and we are not used to the heat so that took it’s toll on us a bit. We left Blytheville, AR early to try to beat the heat a bit. 17 miles down the road we came to the town of Osceola – really neat town with lots of historic markers and significance. The people in town were also great and very friendly- they even were interested in doing a story on us in the local paper – but we just could not get it organized. Stopped at the local Chamber and they were very helpful and told us about a great café in the Town of Wilson 11 miles down the road. So we did not stop for a snack in Osceola and planned to have lunch at the recommended café. We were glad we waited the food at the Wilson Café was very good – a grilled cheese sandwich with salmon and other goodies – Yummy!! The owner of the café knew we were coming due to a phone call from the woman at the Chamber in Osceola – he was pleased to meet us and wanted the scoop on our ride – him and his wife also bicycle. We spent a little extra time talking with him. But all to soon had to continue on. We continued along Hwy 61 to the town of Joiner. 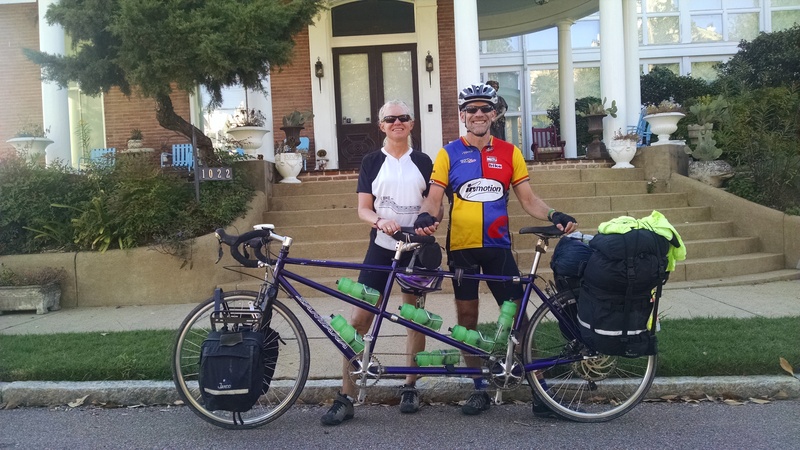 The route actually went about 40 miles to the west but we decided to continue the 7 miles down the road to Joiner rather than take the 40 mile loop – we wanted to get to Memphis. The rides between Wilson and Joiner was interesting because it had a cotton processing plant on it and we saw rows and rows of bailed cotton getting ready to be processed, also lots of cotton laying along the road edge. Tracy finally picked up some cotton from the roadside and put it in a bag to bring home – I am sure the locals thought she was nuts!! The ride continued to Marion on Hwy 77. 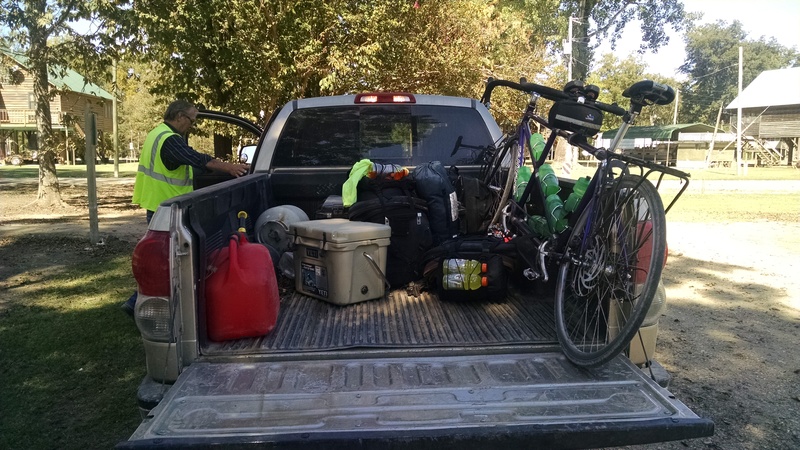 When we reached the city we realized we were in need of water to finish the ride to Memphis. Peter headed down a side street and Tracy found the Parsonage Bakery and Deli to get water and also a couple of cookies – which we ate tonight they were so good – Tracy had a lemon coconut cookie which she said was amazing – she wished she bought another one!! The café owner asked where we were going and Tracy told her to Memphis but the route to cross the bridge seemed really messy!! Her husband said I can give you a good route and then explained to both of us how to get there on less busy roads. The route they gave us was good but we still had to push the bicycle thru a construction zone and farmers field to actually get to the pedestrian bridge. We actually had to push the bicycle for about a mile thru dirt and construction equipment to get to the access point. Then we had to ride on roads under the freeway we were crossing the Mississippi on three different times and then when we finally got to the point where you could actually access the pedestrian walkway – we had to push the bicycle across the grass to get to the access point. The walkway was very narrow (we had to walk the bike across the 2 mile bridge) and extremely dirty – it appeared everyone who drove over the bridge saved their glass bottles to toss them onto the pedestrian walkway – the amount of glass was unbelievable. It was not a very nice crossings and we would not recommend it to anyone. Fortunately they are in the process of building a new bicycle and pedestrian crossing – in fact they were pouring cement on some of the new trail as we pushed our bike along – it is suppose to be done in 2016 – it will be a much needed improvement. We will have to come back to try out the new trail!! We finally made it across and needed to find somewhere to stay in Memphis – Tracy worked on that, while Peter took a nap in the park. We found a room in the downtown area and can take the trolley or just walk out of our room to access all the action in the downtown area Beale Street, Front Street and Riverside Drive. Tomorrow is a day off and we plan to sleep in late – at least Tracy does and then explore the city and maybe go out to check out Graceland. Looking forward to checking out the city and plan to check out the Cotton Museum. Attached are some pictures and a video from the past few days. Today’s plan were to head to Big Oak Tree State Park near East Prairie, MO. The park is run by the Missouri Department of Natural Resources and is a beautiful park. The park is 1,029 acres of the areas original landscape and has been preserved and stands out as an island of trees in a sea of agriculture. Trees in the park are unsurpassed in the size for the state and the park was once home to 21 state or national champions. It was fun to walk on the board walk out in to the park and see the trees first hand. We were the only people in the park and really enjoyed being there. 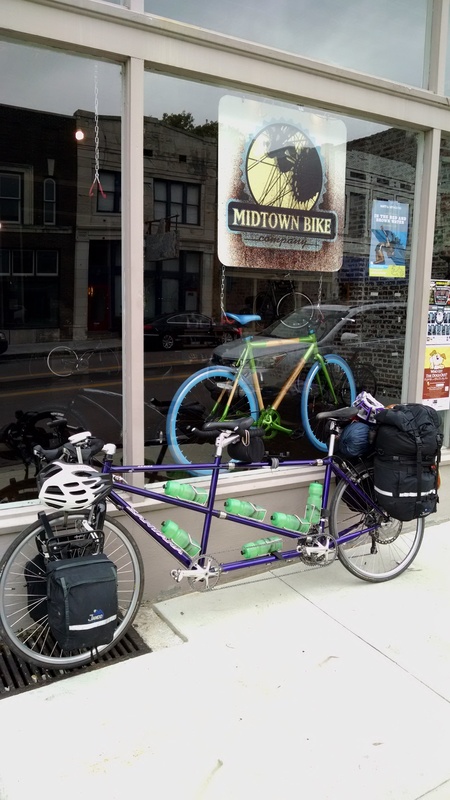 While bicycling out to the park and towards the ferry to Kentucky – three different motor vehicle drivers stopped us to tell us the ferry was not operating and make sure we were aware of that so we did not bicycle the 12 miles and then find out and have to bicycle all the way back. We even had an older man who grew up in the area drive by a second time to check our revised route to Arkansas because he wanted to make sure we had a good route and the roads were in good shape. The 2011 flood resulted in the Army Corp of Engineers blowing the levee in the area to relieve the Mississippi River flooding. One of the park rangers home was up on 12 foot high stilts and he still ended up with 2 feet of water in his house. There was lots of damage to the roads and the homes in the area – they have repaired the roads but few homes are back. So a quick change of plans kept us on the west side of the river heading to Arkansas. It was cool to be riding along the bottom of the levee and we also rode on top the levee for a section of the ride today – very interesting. The plan change also resulted in a much longer ride than anticipated because there really was no where to stay until we got into Arkansas. Our ride was good though mainly on roads just to the west of I 55- the roads were in good shape and had little traffic. We also saw our first cotton fields – very cool and funny to see cotton balls laying on the side of the road and blowing around. Many of the fields were being harvested and they actually put the cotton in big rolls similar to what they do in the Midwest with hay. We have found the people in southern Missouri and Arkansas to be very friendly and whenever we stopped we had lots of conversation and questions to answer. We told our story many times today and people were very interested and intrigued. Also it was not uncommon for drivers to beep and wave when passing in both directions. Tomorrow we head to Memphis, TN hopefully; getting across the Mississippi River may be a challenge!! Tried to put up videos and pictures but no luck tonight – connection to slow – will try again tomorrow.